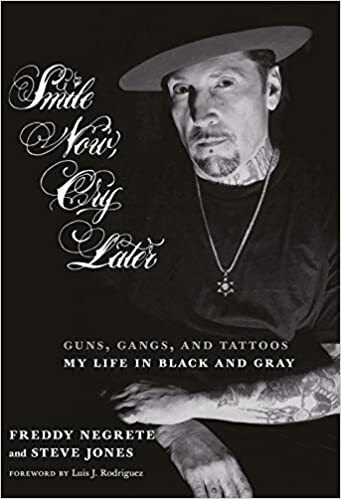 Legendary tattoo artist Freddy Negrete is best known for his pioneering black-and-gray tattoo style, honed while serving time in the California State Prison system during a youth mired in abuse, gang life, and drug addiction. His “prison-style” designs eventually found their way out onto the streets of East LA and, in 1980, he created a piece that earned him a Tattoo Artist of the Year award. Freddy has been featured in the History Channel’s Marked series, in the documentary Tattoo Nation, on Spike TV’s Inkmaster as a guest judge, and in numerous print and online media. He has worked as a technical consultant and tattoo artist on over 30 Hollywood films including Batman, Blade, Con Air, Falling Down and Austin Powers. He currently works at The Shamrock Social Club on the Sunset Strip with his son, Isaiah and has been a volunteer counselor at the Beit T’Shuvah residential treatment center for eight years. His memoir, Smile Now, Cry Later, cowritten with Steve Jones, was released in 2016.